Oak 9"H Pedestal with 4 drawers & "cubby" at foot. Create function where none existed before! Under bed storage systems are the ultimate addition to any bedroom! Also available in 12" and 14". 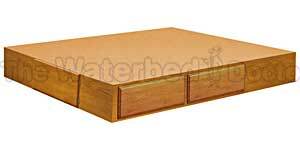 7-Ply Birch Drawer Sides • Will not warp or crack and ensures years of trouble free use. Hinged Door At The Foot of The Pedestal • Maximizes storage by using the center space under the mattress. Solid Wood Framing • Creates stability and offers perfect grain & stain match with beds and other casepieces. Available In Honey Oak Finish • Coordinates with virtually all bed styles, these pedestals can be added at any time.